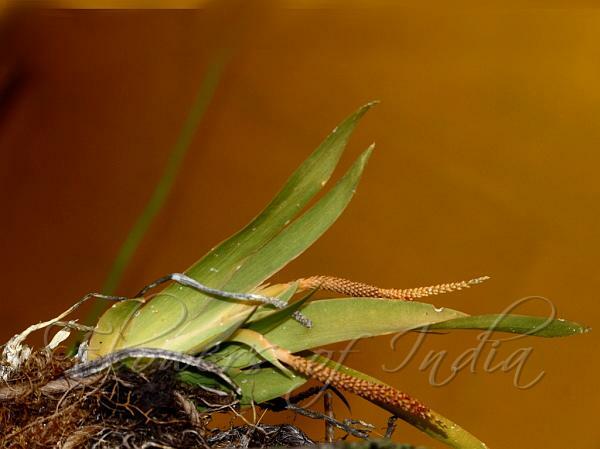 Swaminathan's Oberonia is an stemless orchid, found drooping from tree branches. It is named for M. S. Swaminathan, Chairman of the M.S. Swaminathan Research Foundation, Chennai, India. Leaves are 4-6, pale green, jointed at base, 15-16 x 1.6-1.8 cm, distichous, oblong-ensiform, pointed or tapering at tip. Flowering stem is shorter than the larger leaf, up to 14 cm long, flattened, adnate to the reduced uppermost leaf. Flowers are borne in a many-flowered spike, about 13 cm long, with a distinct sterile about 1 cm long tip, slightly decurved; bracts slightly larger than the ovary and flower-stalk, about 2.0-1.5 mm, elliptic-oblong, deeply rounded toothed, somewhat pointed-rounded at tip, gland-dotted. Flowers are tiny, brick-red, spirally arranged, shortly stalked or nearly stalkless, about 4.2x1.4 mm, about 2 mm across. Capsules are short-stalked, crowned by the marcescent flower. 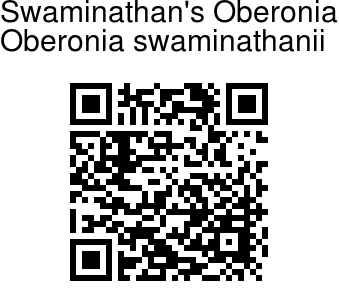 Swaminathan's Oberonia is endemic to Southern Western Ghats. Flowering: August-November.